Erin Brannigan and Rhiannon Newton in dialogue with Newton’s recent choreographic work Doing Dancing (Firstdraft Gallery, Sydney, 2nd August – 25th August 2017). What is the appropriate verb for the process through which dancing comes into being? While searching for a word that more aptly describes the embodied decision-making processes of dancing or choreographing, it’s important to keep this conversation butted up against the terms of language-based knowledge (‘thought’, ‘intelligence’, ‘information’). If it’s not ‘thinking through dance’, what is it? What is it to stay in the zone of sensation, expanding and thickening the experiential field before recognition, using methods such as interruption, repetition, exhaustion or constant variation? How can we name this commitment to the multiplicities of the decentred corporeal field, the suspension of a shift from experience to cognition? The very fact that it is a verb we search for emphasises the time-based nature of the action and the need for the dancer to be amongst the complex network of factors acting into the event. If we are not to use ‘dancing’ itself as an all-encompassing descriptor of the somatic, mental, imaginative, memory-based and responsive processes occurring during dance, or a choreographic process, is it more aptly described as ‘doing dancing’? Erin: What is the appropriate verb for the process through which dancing comes into being? Many people describe it as ‘thinking through the body,’ but thinking belongs to the language of knowledge and cognition. Disciplines such as philosophy command the business of thinking in a way that has defined and determined it. What is the process of dancing if it’s not based on a model of thought? If it’s not ‘thinking through dance’, what might it be? What is it to stay in the zone of sensation, expanding and thickening the experiential field before recognition, using methods such as interruption, repetition, exhaustion or constant variation, and how can we name this? as a producer, the artist is namely skilled at numerous creative and production techniques that go hand in hand with the development of contemporary capitalism… (There is) a fetishisation of non-material and speculative experience as the basic social and communicative experience that can be enabled by artistic work. 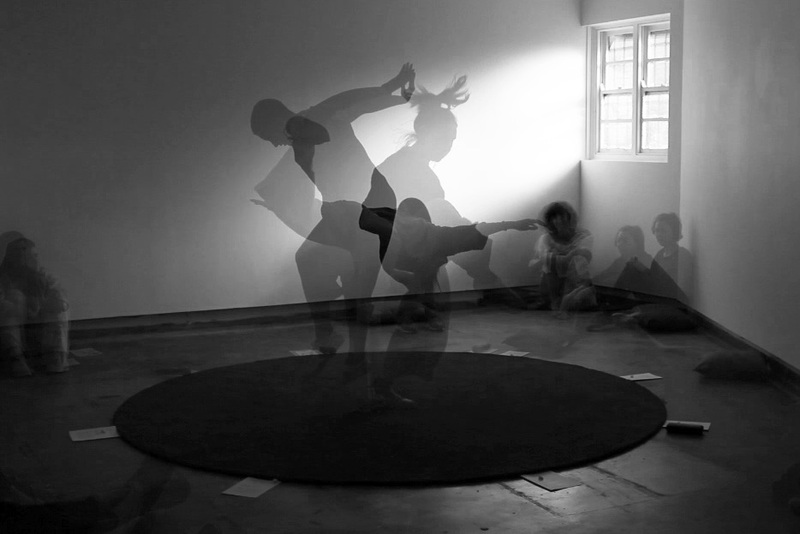 Choreographer Shelley Lasica describes a type of expertise in ‘having in your body and head many many things happening simultaneously… [finding] ways to keep on feeding different sorts of information to keep those things active.’ This describes a commitment to the multiplicities of the decentered corporeal field, suspending the shift away from experience and towards a focused form of cognition. Is this, as you have suggested in your recent work, more aptly described as ‘doing dancing’? R: Shelley’s description of holding and processing many things at once makes me think of large data farms busily dancing away underneath deserts; transmitting news along cables beneath oceans; producing information out of thin air (clouds) – seemingly magical and immediate, and yet utterly physical and time-based. When I was first thinking about Doing Dancing – and I can’t deny that I was sitting at my computer thinking/imagining – I wanted to make the multiplicity of dancing, the many things the dancer is doing at once, somehow more visible, or laid out beside one another, so that you could kind of get inside the machine of dance. At the same time I also wanted to remind myself that dance is just the singular action of dance – someone might walk by the performance in the first hour and think ‘oh she’s just dancing around’ and come back in the second hour and again think ‘oh she’s still just dancing around’. The collapse of dance into a single general action is both devastating and wonderful somehow. This is where I think duration becomes key to a discussion about what verb might best be used – if we are not to use ‘dancing’ itself as an all encompassing descriptor of the somatic, mental, imaginative, memory-based and responsive processes occurring during dance, or a choreographic process. That it is a verb we search for emphasises the time-based nature of the form, and the need to be amongst the complex network of factors acting into the event. For me what is important to being with dance is the capacity to, as Gertrude Stein says, notice ‘one becoming another kind of a one.’ As we dance, things, movements, gestures or expressions are temporary fleeting objects, or ‘ones’, that are somehow recognisable, or meaningful, for the way that they are different, or similar, to the ‘ones’ or bits of dance that precede or follow them. This constant movement (becomings, transformations or differentiations) between ‘things’ or ‘ones’ is perhaps where the dancing is happening. The time-axis is therefore critical. E: So noticing, moving, becoming, transforming, changing, witnessing are all important. This group of terms really illustrates the shuttling between inside and outside, perception and action that describes the kind of processing centre of your data farm. It also reminds me of the ‘centre of indetermination’ that we find in Gilles Deleuze’s philosophy when he discusses affect. This is based on Henri Bergson’s ‘living-images or matters’ that have a ‘receptive or sensorial’ facet. Which all really calls for the complexities of a human agent. Apart from time here you also emphasise movement, ‘constant movement’, which recalls the ‘flow’ of dance that has also been critiqued in dance studies. To take the movement out of dance has been one of the most radical creative and theoretical moves of the past 10 years. But nothing can stop the flow or dureé of time, so this has been a dialogue with the impossible. we should think of movement as qualitative disturbance, a constant changing of the forces of life, a temporal dynamics and materiality of space… Pleasure springs from the fact that movement can induce change, that it can function as an important point of differentiation between spectral change and change that directly affects the body and its relations to the world. With Doing Dancing I was thinking about creating relationships between duration, repetition and accumulation that might support an experience of this kind of change/movement. It is an attempt, I guess, to create the conditions for dancing to happen – and to get a bit closer to the process by which this dance is happening. I chose the title ‘Doing Dancing’, a phrase from Gertrude Stein’s ‘Orta Or One Dancing’, because of the fact that it takes longer to say it seems to prolong the duration of the present instance in which one is doing the dancing. E: ‘Doing dancing’ as a verb-formation does, as you suggest, cleave some space between the dancing and the doing. ‘Being with dance’, as you describe it in a different way, puts the subject into a relation with the dancing that interferes with the direct inspiration or intuition cited by artists such as Isadora Duncan. If we can distance the dancing from the body/subject, how far can it go? R: Using ‘doing’ ahead of ‘dancing’ implies a certain intentionality, or awareness of one’s own dancing. A focus on ‘doing’ also perhaps takes attention away from pre-emptive or reflective cognition, where judgement, planning and self-consciousness maybe playing out. I also like the way ‘doing dancing’ takes dance out of an economy of having to produce something for someone. The language of ‘doing’ helps me to think of the dancing as an environment, something that is not new or created by the dancer – but existing material that can be walked through, in a sense. Both the dancer and the viewer dwell in this environment and the performance becomes the time they spend dwelling together – there is nothing to take away or exchange. And perhaps the question of how far can it go is again a question of duration – the time spent together perhaps? E: So this gap between the dancing and the doing of the body/subject is enriched – and expanded – by duration? ‘Prolonging the present instance’ that is filled up with attention and choice-making resonates with Shelley’s description of dancing, the data farms, and that ‘zone of sensation’ that I opened with. Poet-theorist Lyn Hejinian gestures to the shift beyond poetic ‘thought’ to the moment of spontaneous composition where something beyond cognitive thought is happening, and the resulting capacity of the work ‘to be periodically surprised by its own inherent logics.’ Perhaps ‘doing dancing’ is the equivalent of Hejinian’s ‘language writing,’ which describes this compressed distance between ‘doing’ and the material thing. But now we are talking about a specific type of dancing – improvisation – which is your practice. Can we talk about a spectrum or scale regarding the relationship between the doing and the dancing, with this kind of dancing exemplifying compression? R: I like the way this implies labour that then gives rise to something seemingly spontaneous – the dance emerges from an increasingly specific logic between the dancer, the context and the accumulating dance. I have been thinking about autopoiesis, or more recently sym-poiesis, as models for making and staying with dance. I am attracted to the notion of sym-poiesis, which prioritises a decentralised view-point, in which the agency of environmental and contextual factors are significantly weighted. Equally the physicality and duration of labour – the time spent learning, doing and practicing, the embodied accumulation of experience – mustn’t be forgotten in a conversation about spontaneity. I find it very seductive to imagine a dance or choreography that magically produces itself; to outsource dance to dance. But perhaps it is important to be reminded of the invisible labour that has taken place prior, or behind the scenes, or long ago that is nonetheless giving rise to an experience, or sensation, of spontaneity. E: Could that sense of spontaneity – or apparition of a kind of magic – that may arise for the subject really already be there in the context, requiring some kind of co-recognition? R: In the final performance of Doing Dancing at Firstdraft there was a dog in the audience. It sat quietly and calmly for some time until I did some sort of fast, low-to-the-ground movement, at which it barked and sort of went to attack me. Despite not directing the movement toward the dog, something significant enough shifted in nature of the movement for the dog to register it as other-than-human, or as something that had the potential to interact with it in unexpected ways. I guess this is an example of a kind of distributed doing, or co-operative realisation of a dancing object. I would hesitate to say that this moment was lying in wait for us to recognise, or that the dog’s attendance gave rise to the particular movement. However the dog’s reaction did spark a feeling of co-recognition throughout the room, and the author-ity of this recognition seemed to be largely weighted with the dog. There is a quality at play in this more-than-human network of dancing that André Lepecki (after Heinrich von Kleist) might describe as seriousness, as in this account of a public fight between a bear and a man, which perhaps resounds tonally with an approach to dance that brings doing ahead of thinking or performing. In its fight with the human, the animal surpasses its opponent on all levels – not only in grace, economy of effort, precision of movement, and lack of affectation…but also through an additional, and quite surprising element: its ‘seriousness’…(The bear’s) movements are always in consistency with all of the micro-events simultaneously unfolding in its environment. This perhaps describes a sense of performing on the part of the man, rather than doing. I would hesitate to say the bear performs, but the man seems to. In which sense the animal ‘does the doing’ with greater intensity than the man. I wouldn’t like to draw this as an opposition – but rather say that in bringing the terms doing and dancing together, there is an attempt to attend to this gap between what might be called performing and serious doing. E: If the imperative of survival leads to a seriousness in the bear, I agree there’s a different but comparable form of seriousness when the imperative becomes to dance in the way we are trying to talk about it here. Both involve an attunement with the moment, but the gap (as a spectrum) between doing and dancing distinguishes the latter activity, while for Kleist/Lepecki, the compression is so complete for the bear that the order is reversed in a form of anticipatory action. In dancing, sometimes this gap or distance between the act and the activity might be filled up with a strong sense of performance that is a particular form of this reflexivity, that may be up one end of the spectrum where there is a greater distance between doing and dancing. So what about this question of doing rather than thinking dance. What is the verb for this ‘embodied decision-making’ characterised by a decentralised multiplicity within each moment and between each moment that is corporeal/somatic, but also fed by ‘mental, imaginative, memory-based and responsive processes’? This action that is self-reflexive, relational, expanded and durational? Dance artist Chrysa Parkinson says, ‘if you think of the material of performance as perception, or as relationship (as Deborah [Hay] would say), then some form of ‘doing it’ to understand it makes sense.’ Dancing then exists in the doing and understanding it is contingent upon the doing and can’t exist without it. As you say, a focus on ‘doing’ ‘takes attention away from pre-emptive or reflective cognition’. Doing dancing. Bojana Kunst, Artist At Work- Proximity of Art and Capitalism (Alresford, Hants: Zero Books 2014), 145. Shelley Lasica, unpublished interview with Brannigan, 2017. Rhiannon Newton, ‘Doing Dancing,’ First Draft Gallery, Sydney, 2nd August – 25th August 2017. 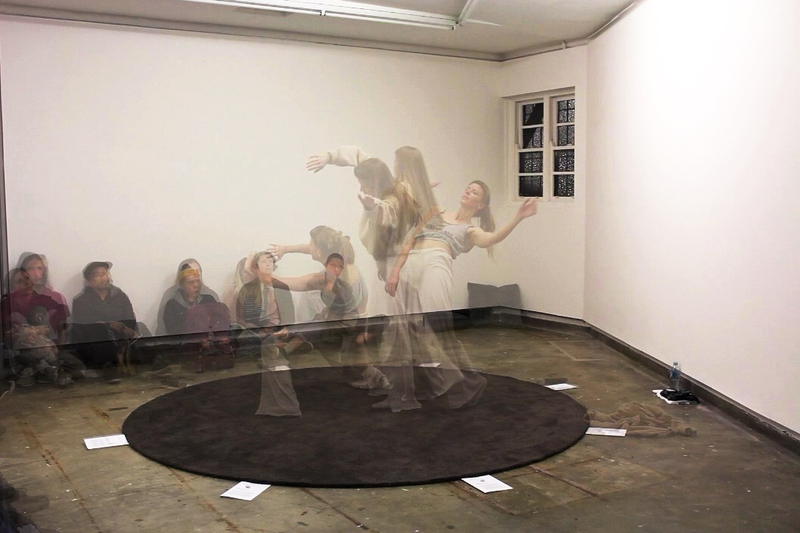 This gallery-based work incorporated Gertrude Stein’s text on Isadora Duncan entitled ‘Orta, or One Dancing’, live durational performance, and the production of a real-time digital archive. Gertrude Stein, ‘Orta, Or One Dancing,’ published in A Stein Reader Ed. Ulla E. Dydo (Evanston, Illinois: Northwestern University Press, 1993), 122. Gilles Deleuze, Cinema 1: The Movement-Image, trans. Hugh Tomlinson and Barbara Habberjam, Minneapolis: University of Minnesota Press, 1986, 65. See for instance André Lepecki, Exhausting Dance: Performance and Politics of Movement (London: Routledge, 2006). Lyn Hejinian, The Language of Inquiry (Berkeley, University of California Press, 2000), 10. On ‘autopoeisis’ see Humberto Maturana & Francisco Varela, Autopoiesis and Cognition: the Realization of the Living (Dordrecht, Holland: D. Reidel Publishing Co., 1980), 78. On ‘sympoiesis’ see Donna Haraway, Staying with the Trouble; Making Kin in the Chthulucene (Durham, NC: Duke University Press, 2016), 58. Chrysa Parkinson, ‘Reflecting on Practice,’ in Ed. Ingvartsen, Mette (ed.) 6 Months, 1 Location (6M1L), (Everybodys Publications, 2009), 32.